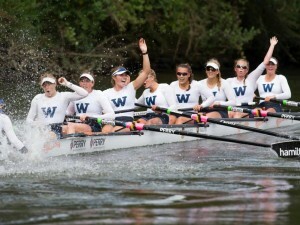 After a weekend of conference championships the CRCA releases the ninth regular season USRowing/Collegiate Rowing Coaches Association Poll presented by Pocock Racing Shells. The top spots remain the same with the University of Washington for Division I, Western Washington University for Division II, and Bates College for Division III. Washington holds the lead position for the seventh week in a row, with 24 first-place votes. University of California, Berkeley remains in second place with the final first place vote. The remainder of the top five saw University of Michigan move up to third, and then a tie for fourth between the University of Texas and The Ohio State University. In the DII poll Western Washington University is first again this week with all five first-place votes. University of Central Oklahoma stays in second, and Mercyhurst University jumps up in third. Humboldt State University stays in fourth this week, and the University of California, San Diego moves up into fifth. Bates College stays in first again this week in the DIII poll, claiming all ten first place votes. Williams College moves up into second, with Ithaca College stays in third. Wellesley College moves up into fourth place this week, and Tufts jumps up as well rounding out the top five.